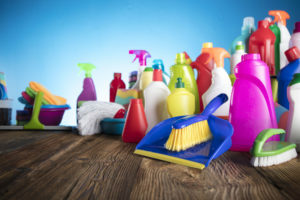 The irony of having an abundance of cleaning supplies in your home, ranging from common household products to the more pricy cleaners, is that they can create an unsightly disorder in their own right. Clever organization of your cleaners will not only help you use available space in a more rational way, but also make cleaning much easier and more time-efficient. In fact, organizing your cleaning supplies is an essential part of an efficient cleaning routine. Professional cleaning services Culver City are another way to go, and here they share what years of experience have taught them – preparation is key. Just like with your personal hygiene and beauty products, you probably have cleaning supplies you use on a daily or weekly basis, those you never use, and those you don’t even know you have. Another problem is they are probably scattered all over the place, or, even worse, jumbled together. First things first – get rid of all the nearly empty containers and the cleaners well past their expiration date. Throw away any brooms or brushes that have been rendered practically useless over the years. They are inexpensive and should be replaced on regular basis for health reasons alone. Decluttering will ease your mental burden and narrowing it down to the essentials will make sorting and organizing them easier. Depending on the storage space available, the easiest way to categorize your cleaning essentials is to have separate containers, say, a box or a bucket, designated for all the tools and products used in a certain room of the house. For the lucky ones with generous living space, having a neatly organized closet is an answer to all the questions, as you can put the cleaning supplies for each room in it. tension rods under the sink – hang all the spray cleaners and you’ll get extra storage space below. Cleaning Services Culver City to the rescue! Enjoy your time at home and never again be forced to spend an absurd amount of time merely prepping for house cleaning, only to feel worn-out halfway through. Cleaning Services Culver City spares you the dirty work and leaves your home spick-and-span. Call us today and let us make your life easier!